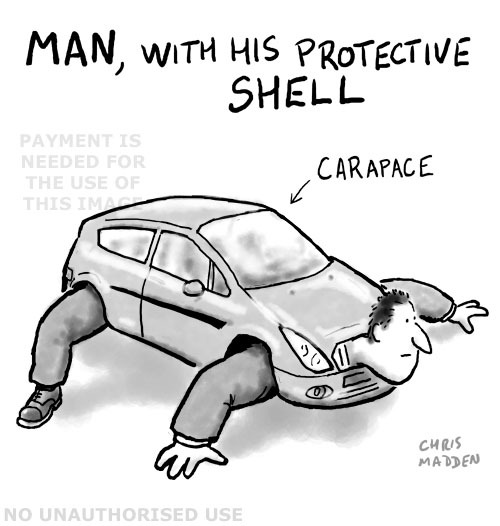 Cartoon – a car as a protective shell or carapace. 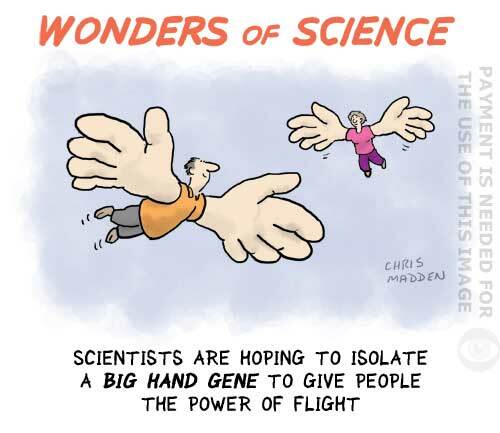 The illustration shows the results of scientists modifying the genes that are responsible for hand size. This strip is about the concept of evolution as a form of evolutionary arms race, where one thing evolves into another, slightly superior form. 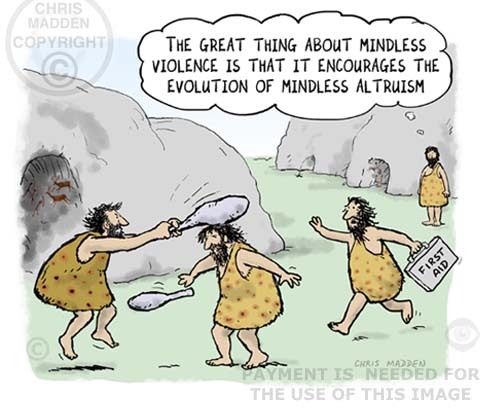 An illustration using the classic ‘evolution of man from ape’ tableau, showing modern man developing a sense of humour. Michelangelo – Hand of God parody. Did life come from outer space? Parody of Michelangelo’s Hand of God painting in the Sistine Chapel, being used to illustrate the concept that live on earth could have been deliberately brought to earth from outer space by aliens. The cartoon could be linked to theories such as the ones offered in books such as Erich von Daniken’s “Chariots of the Gods”, although personally I’d rather be disassociated with such theories (if that’s what such sensationalist speculation can be called). The concept of Was God an Astronaut? has been revived recently with the film Prometheus by Ridley Scott, and will no doubt be aired again when the sequel is released. Cartoon. How an asteroid made the dinosaurs extinct. 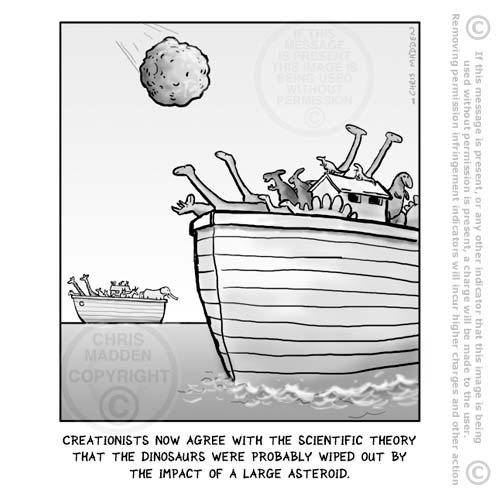 The dinosaurs in this cartoon are in an ark similar to Noah’s ark. It is in fact a second ark constructed by Noah. He put the mammals, birds and so on in one ark and the dinosaurs in the other. The asteroid hurtled towards the earth and destroyed the ark carrying the dinosaurs, rendering them extinct. This is an absurdist cartoon. 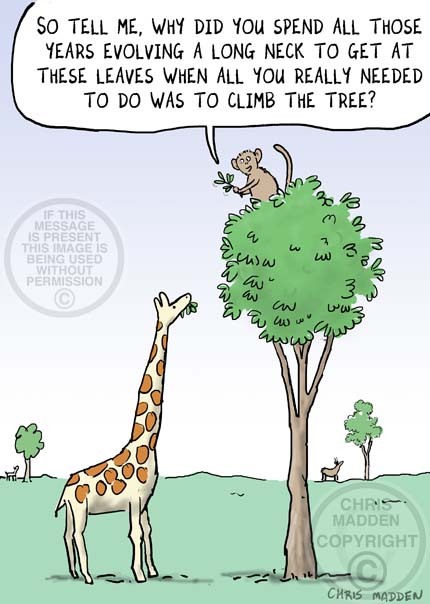 The cartoon has some similarities to the Far Side cartoons of Gary Larson. 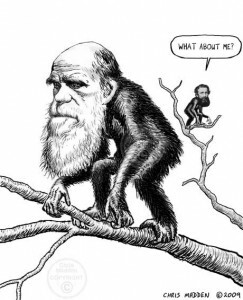 Charles Darwin caricature as a cartoon ape, with an Alfred Russel Wallace cartoon ape in the background, based on the famous Darwin ‘monkey’ caricature of 1871. This illustration is based on a redrawn version of a famous caricature of Charles Darwin – however I’ve added in the background the figure of Alfred Russel Wallace. Wallace thought of the theory of evolution by natural selection independently of Darwin, however he gets little credit for it, with Darwin’s name being the only one in general public awareness. This conceptual illustration may be about the fact that because we are evolved from fish we still see the world through our animal sensibilities. 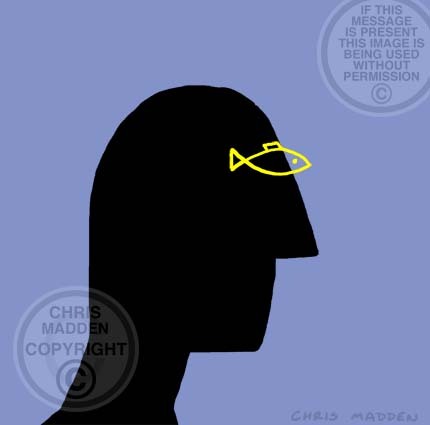 Or maybe, because the fish eye is similar to the fish symbol used by some Christian groups, is this man looking at the world through the eyes of someone with a religious outlook? Maybe it’s an illustration about the way that people generally see the world in the way that they want to see it, interpreting it through their own preconceived ideas and prejudices.